appropriately, it can be a valuable tool for deepening one’s understanding of Self and Path. Examining one’s life through the lens of a tarot deck can bring new perspective to familiar behaviours and situations. For me, this is not dissimilar to paying attention to one’s dream life or tracking the synchronicities that occur in the course of daily living. Similarly, the labyrinth offers a pattern that can deepen one’s consciousness and increase one’s perceptions of the path ahead. Symbols and images are the way the soul makes sense of the world, speaking to the soul in ways that words cannot, calling upon the imagination to make sense of both the image and one’s experience with the image. According to philosopher and writer Thomas Moore, imagery is the soul’s native language, and I would add that becoming aware of our personal symbols allows us to create connection with the world around us and to better understand our place in the cosmos. Symbols, according to Carl Jung, are universal elements that cross the boundaries of time and culture. They can be both personal and collective; often the meaning of a symbol deepens and develops for a person as she matures. Usually people find they are drawn towards particular symbols that, for whatever reason, strike chords of recognition, interest, and curiosity deep within the being. If pursued, these symbols can be a guide to transformation. I began my study of symbolism as a dreamworker, using Jungian techniques for looking at dreams as symbolic communications from the dreamer’s unconscious. As my study of symbolism deepened, I began looking further afield for other systems based on symbolic languaging. Intrigued by its long history and striking visual imagery, I decided to study tarot by choosing an appealing deck and introducing a gentle practice of drawing a single card each morning. Much like the history of the labyrinth symbol, the origins of tarot are rather vague and shrouded in myth and speculation. The name comes from an Italian card game, Tarocchi (or the French variant, Les Tarots). They are most likely descendants of medieval playing cards that were at some point imbued with meaning and symbolism, some of it related to esoteric traditions such astrology, numerology, and even the Kabalah. Looking at a card drawn at random invites viewers to make their own associations, gaining insight in the process. I then used the accompanying text and my own daily experience to explore tarot’s structure and symbolism so that over time I managed to incorporate it as an adjunct to my dreamwork, furthering my work with symbols and the development of the soul. Tarot cards are essentially collections of symbols, organized as a set of illustrated cards that follow certain patterns, but are individualized by the artists who create the decks so that each deck reflects both traditional structures and patterns and also personal insights and associations from the deck’s creator. For the purpose of this discussion, I will be using the Ryder-Waite-Smith (RWS) deck as the standard cards for my comparisons and correlations, as its images and structures are familiar to most tarot enthusiasts. Originally published in England in 1909, this 78-card deck has become something of a template for new decks by contemporary artists. These decks consist of 22 Major Arcana cards (sometimes called trumps) which illustrate archetypal themes of spiritual development, and 40 Minor Arcana cards plus 16 court cards that are divided into 4 suits (Wands, Cups, Swords, and Pentacles), much like those of modern playing cards. The Minor Arcana cards represent situations that might be encountered in ordinary life. For many, tarot cards are spiritual tools that promote individuation and transformation. They are typically used for meditation, divination, counselling, self-healing, and creativity. Having already gained an appreciation for symbology through my dreamwork and tarot study, I met my first labyrinth in San Francisco in the mid-1990’s. The labyrinth is an archetypal symbol that has a long but vague history that encircles the globe and weaves with subtle grace through the ages of time. It is a potent symbol whose existence transcends boundary, crossing both time and culture with ease, appearing around the world throughout history. Additionally, the labyrinth is unique among symbols in its potential for physical interaction; walking the labyrinth literally allows sustained and direct interaction with an archetype. Over the course of several years, I began to see that my labyrinth walks and my tarot study and readings were beginning to overlap and influence each other, and to my delight, I discovered a number of labyrinths in amongst the symbols contained in some of the modern decks I was gradually collecting. As the labyrinth symbol continues to evolve and permeate mainstream consciousness, it becomes ever more visible in today’s society, with various meanings attached, of course. Some see the labyrinth as it comes out of cultural mythology, a puzzling structure that offers imprisonment and/or protection, depending on perspective. Others think of it as a walkable symbol that offers the safety and freedom of a single path leading both to and from a central goal – either interpretation offers a canvas for projection and reflection, and both are used by symbolic artists. The rising popularity of the labyrinth is similar to that of tarot cards, as both have seen increasing inclusion in mainstream culture over the past few decades, resulting in a migration and cross-pollination of the ideas and symbols. I see this in the world at large as labyrinth installations increase year by year and my shelves fill with new tarot books and cards. Labyrinths and tarot cards, as potent sources of symbolic imagery, speak to the rapid expansion of global consciousness that is afforded by rapid social change and advances in modern technology, as well as in our need to keep pace spiritually on the levels of our personal and collective unconscious. So where are labyrinths appearing in the tarot community? First, there are card decks designed specifically around the concept of labyrinths. 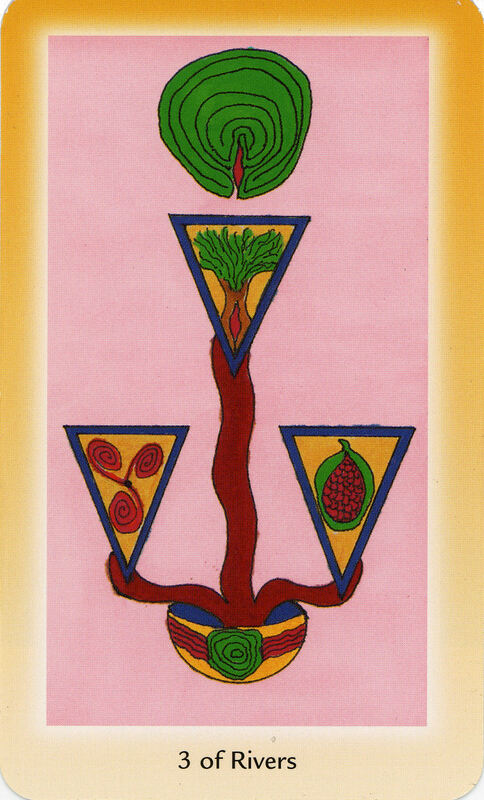 Secondly, contemporary artists and writers are using the symbol to illustrate traditional tarot concepts. I have only a modest collection of decks, but the number of labyrinth images I found amongst them was intriguing, and shows a gradual rise in the inclusion of the symbol in contemporary decks. A modern Labyrinth Tarot by Spanish artist Luis Royo has recently been published and made available internationally. Despite its name, however, the deck’s theme doesn’t make an obvious connection to labyrinths or labyrinth mythology, nor curiously is there a single labyrinth amongst the images on the cards. A careful search through my collection of tarot collection revealed labyrinth images in a number of other decks. Coming across them over the years has been a delight, especially as some of the decks precede my interest in labyrinths, another example of the labyrinth symbol being in my life before I became aware of it consciously. Many decks contain spirals and labyrinthine shapes – labyrinth innuendos, so to speak – but let’s focus on the instances of actual labyrinth images and the concepts they illustrate, and also note a few of the cards which contain images suggestive of labyrinth shapes. 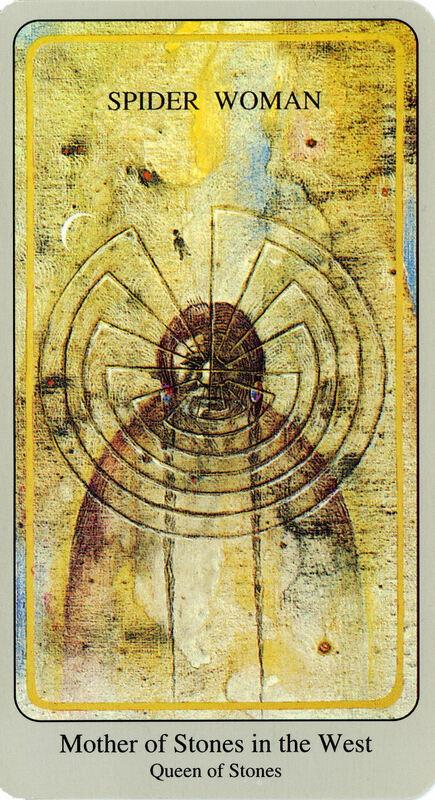 Mother Peace Tarot (1983): The Motherpeace cards don’t contain actual labyrinths, but there are two cards which show concentric arcs that have a very labyrinthine appearance, The Shaman of Discs (correlating to the King of Pentacles with his mastery of the physical place) and the Tower. The Shaman of discs is depicted as riding along a canyon trail, with the arcs of the setting sun behind her. This seems entirely congruent with the Native American imagery in which the Man-in-the-Maze design has a little step-out, a resting place for the soul to pause to contemplate life’s journey before stepping into the Great Mystery. When we were in Taos for the Gathering last year, a beautiful young girl who had been raised among the Tohono O’odham told me that for her the labyrinth was always part of a Great Sun meditation. I imagine a great cosmic sun labyrinth when I see this card. The Tower, with its theme of destruction and the crumbling of structure, contains the image of a priestess perched atop a tower. In her hands the priestess catches lightning with her bare hands, and superimposed in front of her are thin lines radiating from her head that have a similar appearance to those described above. 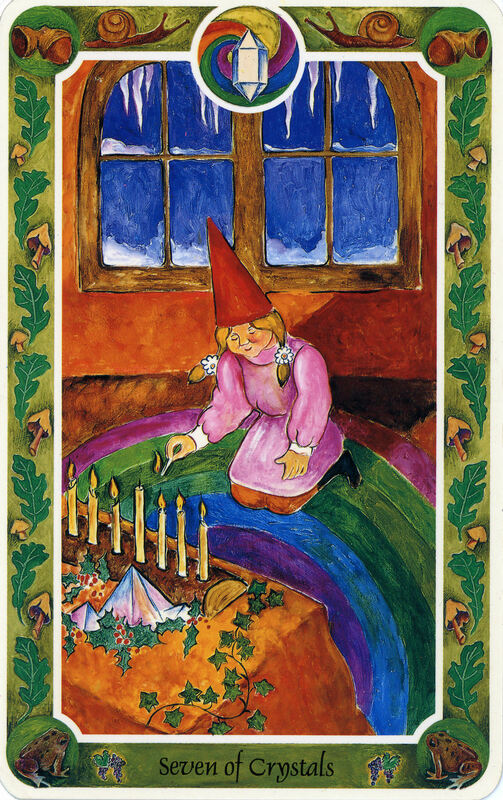 Inner Child Cards (1992): This is another older deck that has been part of my life for years. No labyrinths to be found, but when I look at two of the cards in particular, I imagine that I see the outer circles of the labyrinth. 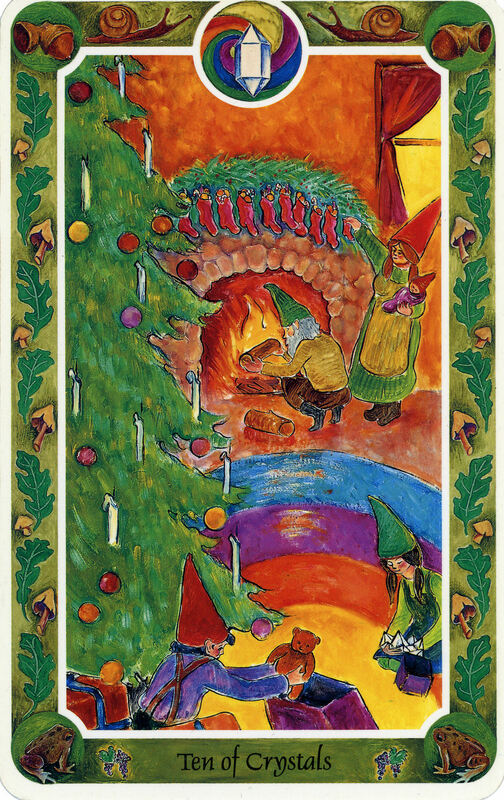 The 7 and 10 of Crystals cards, which correlate to the 7 and 10 of Pentacles respectively, both picture a gnome scene in which the action is taking place on a carpet on with rainbow hued arcs. The commentary for the 7 of Crystals reads, “The young gnome girl is creating a sanctuary for herself, a place where she can go within and seek inner peace, clarity, and vision…. Inner transformation is represented by the rainbow carpet on which she kneels.” Doesn’t that seem rather like she might be kneeling on the outer arcs of a labyrinth? The 10 of Crystals pictures the same room with the same carpet, with images that indicate the scene has moved a few steps closer to the fulfilment of potential. 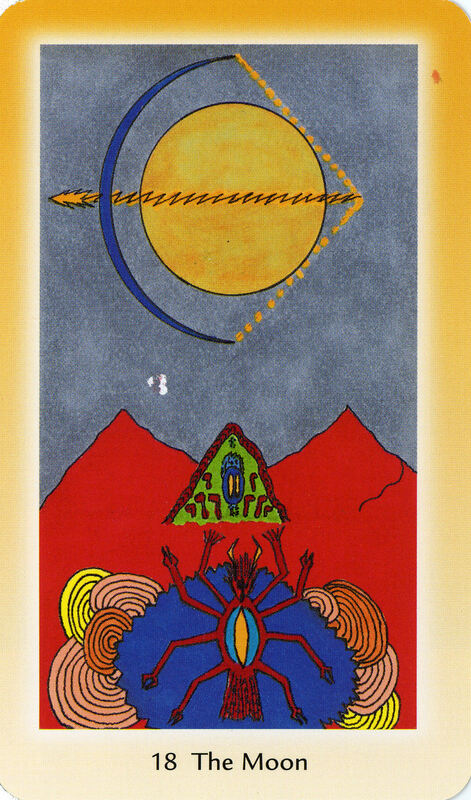 Shining Tribe Tarot (2001): This deck designed and described by Rachel Pollack follows traditional tarot structuring but uses primitive images drawn from spiritual symbols found around the world. Two cards use the labyrinth symbol, and a third is so suggestive of the labyrinth that it’s worth mentioning here. Moon: There is no actual labyrinth on this card, but the central figure, a crayfish-like creature reminiscent of the one on the familiar RWS card, is emerging from a pool surrounded by a grouping of concentric arcs which remind me of the outer circuits of a grouping of labyrinths. The moon card traditionally speaks to the distortion and bewilderment that occurs when we see things only by the light of the moon – things are never what they seem. Pollock says these arcs are inspired by prehistoric stone carvings, which some believe are patterns of lunar movements. The carvings, which I’ve seen many times in Britain and France, are sometimes also mistakenly described as labyrinthine. In the moonlight environment of this card, I see labyrinths whenever I look at it. Anyone who loves the labyrinth symbol will no doubt enjoy coming across it wherever it is found, and for those of us interested in symbolism, studying its appearance in tarot art is both interesting and thought-provoking. Searching through my tarot decks has been a treasure hunt in which I’ve found labyrinths and things labyrinthine. Finding them gradually, over time, has allowed me to consider carefully the intentions of the artist and the associations created. My own relationship with the labyrinth is both academic and spiritual. In my spiritual practice, my experience is an embodied one as I interact with the labyrinth symbol by walking with my feet, my finger, or my eyes. It is, therefore, directly related to my physical journey on the planet; labyrinth walking grounds me and allows me to feel centred in my body. Apparently I’m not alone in this, as many of the artists seem to use it somewhere in the earth suit of Pentacles. There isn’t however, any overarching consensus as the above examples show. In tarot, as in the world, the labyrinth means different things to different people. Both tools, it appears, lend themselves to the sacred task of increasing individual consciousness supporting the soul in its journey through life. Haindl, Herman. Haindl Tarot (cards). Stamford, CT: US Games, 1990. Noble, Vicki. Motherpeace: A Way to the Goddess through Myth, Art and Tarot. San Francisco: HarperCollins, 1983. Lerner, Isha and Ericksen, Amy. Tarot of the Four Elements (book and cards). Rochester, VT: Bear & Company, 2004. Lerner, Isha and Mark. Inner Child Cards (book and cards). Santa Fe, NM: Bear & Company, 1992. Pollack, Rachel. Haindl Tarot: The Major Arcana (Revised Edition). New Jersey: Career Press, 2002. Pollack, Rachel. 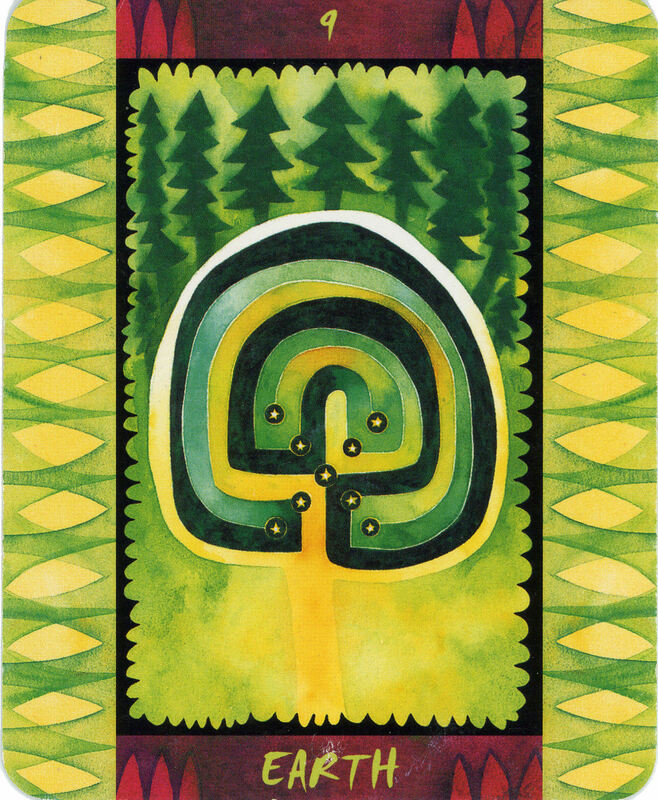 Haindl Tarot: The Minor Arcana (Revised Edition). New Jersey: Career Press, 2002. Pollack, Rachel. 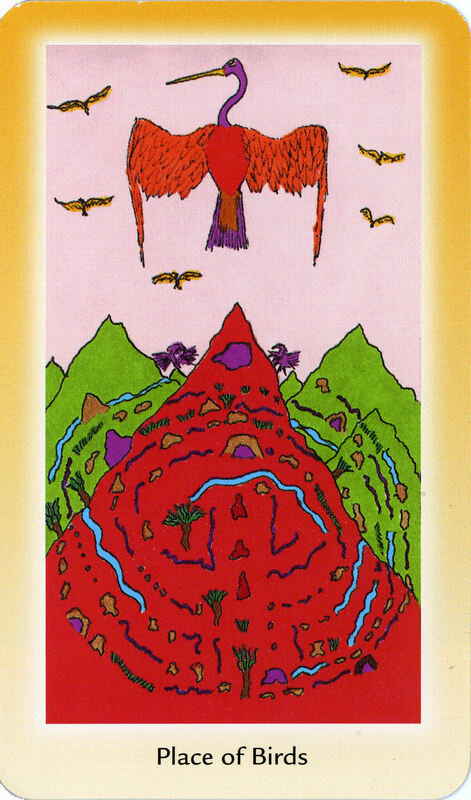 The Shining Tribe Tarot: Awakening the Universal Spirit (book and cards). St. Paul, MN: Llewllyn Publiations, 2001. Provoost, Eric, Minotarot (cards). France: self-published, 1982. Royo, Luis. The Labyrinth Tarot (cards). Vittoria, Spain: Fournier, 2012. Vogel, Karen and Noble, Vicki. Motherpeace Round Tarot (cards). Stamford, CT: US Games Systems, 1983. Waite, Arthur Edward and Smith, Pamela Coleman. The Original Rider Waite Tarot Deck (cards). Stamford, CT: US Games, 1999. 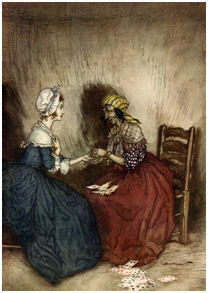 There are many internet sites with good information about all aspects of tarot. I particularly recommend that you visit The Tarot School at www.tarotschool.com, ably administered by Wald and Ruthann Amberstone. If you know of other tarot decks which use the labyrinth symbol amongst their imagery, I’d love to know about them, via the contact form.